Make your workout much more effective and comfortable with this high quality Yoga Mat! Whether you’re an experienced yoga practitioner, seasoned athlete, or simply adding a few exercises to your daily routine, you’ll love this Yoga Mat. Don’t go unprepared to your yoga workouts! This large 173 x 61cm mat was designed with reliability and longevity in mind. With high quality thick cushioned foam, it provides ultimate comfort and softness on any surface. It reduces joint stress and absorbs impact to prevent strain. 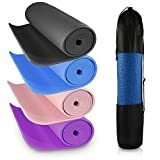 The Yoga Mat can be used for yoga, pilates, strengthening exercises, stretching or any exercises that involve lots of kneeling and lying on the floor. It is great for home usage with your aerobics DVDs, sit-ups or press-ups. You can forget about doing uncomfortable exercises on your carpet. The Yoga Mat rolls up nicely for easy storage so you can place it under the sofa or behind a door. It also comes with a carrying bag that makes it easy to move around and take to the gym or Yoga studio. The Yoga Mat is very versatile and can even be used for camping, fishing, resting, picnic, sleepovers etc. Why wait? Buy today!